Frédéric Chopin: Nocturne in C Sharp minor, Op. Posth. Let me point out right off that there are two editions of this recording for purchase, one containing only the CD and its range of selections, and the other offering both the CD and DVD with all selections given above. The album was issued by the label Naïve to mark the tenth anniversary of Lise de la Salle's first recording with the company, made when she was just fourteen. Obviously she is a major talent. This 2-disc set features repertory that mostly appeared on previous issues. As far as I can determine the Schumann Symphonic Etudes and Chopin Nocturne were not previously recorded by de la Salle, though the Liszt DVD selections all appeared on a 2011 Naïve all-Liszt CD. Still, the Liszt performances on this DVD are different ones, as those on that earlier Liszt CD were recorded in Bremen, Germany. 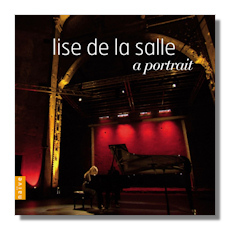 I reviewed three previous discs by Lise de la Salle here at Classical Net, a 2008 collection of concertos by Liszt, Prokofiev and Shostakovich (Naïve 5053), a 2010 Chopin album (Naïve 5215), and the above-referenced Liszt CD (Naïve 5267). I was positive in all three reviews, though I did have a few reservations about her Chopin. In this compilation, I have only high praise for her. I especially like the performances on the DVD: her Liszt is passionate and rich in creamy tones (the Ballade and Funerailles are easily among the best renditions I've heard). De la Salle's Schumann is fiery and Romantic: the Symphonic Etudes rendition is better, I believe, than the new and quite impressive performance by Emanuel Ax, reviewed elsewhere here by me. The Chopin Nocturne is lovely in its mostly hushed sadness and dark mystery. As for the fare on the CD, de la Salle performs Mozart with an energetic charm, making the music sound so spirited and so elegant. She plays the Bach fugue with a decidedly un-Gouldian legato, and for me her approach works fabulously. De la Salle's Rachmaninov Etude comes across with a deft sense for the composer's stormy, dark Romanticism, and her Prokofiev is muscular and incisive in the Roméo and Juliet excerpt, and dazzling and breathless in the brilliant Toccata. Her Chopin is also thoroughly convincing, even if her tempo choices in the first movement of the Second Concerto are a bit relaxed. Her Ravel Une barque sur l'océan is hypnotic and so colorful in the keyboard effects she obtains, and the Shostakovich concerto excerpt shows her to be deftly alert to the tarter lyricism and restive nature of the work's Largo second movement. The pianist that de la Salle reminds me of most is the young Van Cliburn. That is, she plays with a velvety tone that few pianists can emulate, a strong sense for the lyrical elements in the music, and a formidable but never ostentatious technique. Her tempos are always well judged, though she tends to be on the moderate to leisurely side in slower music. This sampling of her skills, along with the three other recordings I have reviewed, convinces me she is among the most important pianists of her generation, maybe any recent generation. She will likely be a major presence on the concert and recording scene for a long time. Though these selections were recorded in a variety of venues, Naïve offers consistently clear and balanced sound. Highly recommended.